(This was originally posted but lost during the server hiccup we had on January 17th). I have a confession to make. I didn’t really like The Legend of Zelda as a kid. Sure, I found it somewhat interesting, but compared to more energetic, kinetic adventures like Super Mario Bros, Zelda just couldn’t hold my attention. I realize how blasphemous this sounds coming from IGN’s lead Nintendo editor and self-professed Zelda junkie, but that’s just the way it was. Zelda, for all its accolades, didn’t speak to me. Flash forward about 10 years, to 1998, the year Ocarina of Time was released. Something about this game enthralled me, like so many of you reading this. I couldn’t get enough. I wanted more art. I wanted more details. I wanted… well, I didn’t want to see video, because that would be spoiling the experience, but everything else was fair game in my mind. When I finally had the golden game in my hands, I was paranoid that everyone else walking by wanted to steal it from me. I vividly remember clutching my bag close to me, certain that someone would realize what was inside, desiring it as much as I did. The next days are a blur, but I do remember staring in awe at the opening screen, an idyllic, gorgeous depiction of Link riding his horse, with Koji Kondo’s superb music calmly playing in the background. Do you remember your first time playing Ocarina of Time? Nothing seemed like it could match that moment. My first thrilling experience with the Legend of Zelda franchise would also never be surpassed. In a way the series, as good as it was and still is, would always coast downhill, never to surpass the perfection that was Ocarina of Time. 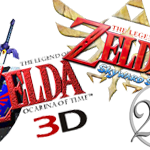 But the more I think about it, Zelda fans might finally see a year that could dethrone 1998 as the best ever for the franchise. Any way you look at it, 2011 just might be the best year yet for those of us who anticipate and cherish every moment in Hyrule. It seems only fitting that a banner year for Zelda would include a remake of one of its finest games. Though seemingly not a launch game for the system, the 3DS version of Ocarina will likely be the best iteration of the classic that earned a perfect score from IGN. Graphics have been upgraded, camera systems have new elements and the dual screens will allow for more fluid controls and easier access to maps. Can perfection be perfected? It will be interesting to see what Nintendo is willing to do. Will we see new enemies or new dungeons? Will the remastered, more challenging Master Quest version of Ocarina of Time be included? Will the 3D effects work well with the admittedly-aged visuals? Regardless of the changes, it’s hard to imagine the core gameplay of Ocarina being damaged. Having just replayed a portion of the game in the past few weeks, it’s undeniable that despite the advancements in the franchise’s mechanics, Ocarina still plays incredibly well. It’s a testament to just how revolutionary and effortless the game was when it was released over a decade ago. I’m sure many of you agree that a year with a new home console Zelda game almost needs no other release, before or after. In many ways, all I can think about before Skyward Sword releases is that I want to play it. And once I’m done with it, I’ll either want to play it again or start wondering what the next installment might hold. Such is the life of a Zelda addict. Have faith – Skyward Sword will deliver. But I have to confess that, like many of you, I find myself skeptical of Skyward Sword, an emotion that surprises me as much as it probably surprises you. Suffice it to say that the game had a poor showing at last year’s E3. Technical problems combined with a poor demonstration of the graphics and gameplay left many, including this editor, a bit put off by the changes being brought to a beloved franchise. As hypocritical as it might sound, the very thing most gamers advocated having in a Wii Zelda, full sword control, was one of the more frustrating parts about the game. Not all hope is lost. This is Zelda, one of Nintendo’s most influential and revered franchises. Nintendo has yet to develop a poor game for the series. No doubt any issues I had at E3 will be ironed out. That might sound like blind optimism, but if there’s any game that has earned the benefit of the doubt, it’s Skyward Sword. Remember how skeptical we were about Wind Waker? Questionable Triforce fetch quest aside, remember how superb that game turned out to be? Here’s the other interesting fact about 2011 as it relates to Zelda. This is the franchise’s 25th anniversary. It will be very interesting to see how Nintendo approaches this milestone. Last year, with Mario, we found ourselves with an exceptionally rare re-release of Super Mario All-Stars. But Zelda has yet to really receive that kind of All-Star treatment. Could you imagine some sort of compilation of the first three Zelda games? What if they did an SNES approach to the first Zelda? Regardless of a silly collector’s book or lackluster soundtrack, I’d be there in a heartbeat. And who knows what else Nintendo could conjure up if it was truly interested in celebrating Link’s birthday?. Whether you’re excited for a re-release of a classic, awaiting a new adventure, or thrilled that your favorite series is turning 25, there’s reason to celebrate. And you can be sure the editors at IGN have their eyes on all of these notable events. We have so many ideas brewing that the question isn’t if we’ll be writing about Zelda this year, but whether we’ll be able to get to everything we want to write. No doubt you’ve already heard about me fishing for artists to help with a Zelda project. With two games and a milestone in 2011, this is truly poised to be the biggest year ever for the Legend of Zelda – a new Renaissance for a game that has already changed the industry in so many ways.